Maria S. Cushing, 63, of Phillips, NE passed away, Thursday April 11, 2019 at CHI Health St. Francis Medical Center. A celebration of life will be 2:00 PM, Saturday, April 13, 2019 at First Christian Church in Aurora, NE with Pastor Bruce Bradley officiating. Maria Solidad Cushing was born in northern Samar, Philippines on April 20, 1955 to Mr. Percibirando and Felicidad Cerbito. Maria was the oldest of six children, two brothers and three sisters. The family lived in a small village and farmed rice. 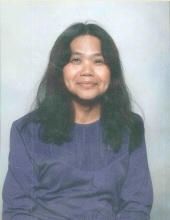 Maria attended Catholic Youth Movement School and graduated in 1974. At the age of 18 Maria moved to Olongago for work to help support the family. Olongago is located closed to Subic Bay Naval base where she met Robert Cushing who was stationed at Subic Bay in 1974. On March 12, 1975 they were married and had their first child Gloria. Gloria was born premature and passed away on July 19, 1975. Robert and Maria moved to San Diego in November 1975 and rented an apartment. While in San Diego, CA she had her second child Ceaser on August 3, 1976. In March of 1977 Robert and Maria decided to move to Harvard, NE. Harvard and the surrounding area is home of most of Roberts family. Here she gave birth to her third child Clayton on September 10, 1977 and her fourth Charity on March 26, 1979. Robert and Maria divorced in 1985. Maria stayed in Harvard and raised her three children. She was devoted to her children and gave all her time to bringing them up until they moved with Robert in 1990. While in Harvard she became good friends with Alice Leichleiter and spent time with her. In 1996 Robyn and Maria were reunited and lived together. They remarried on October 30, 2007 and remained married today. Maria was a bit of nomad and was able to visit all 50 states and see numerous landmarks and sites. Eventually she settled down in Phillips, Ne and lived out the rest of her days there. Maria had 10 grandchildren, Jeremy, 19, Amber, 17, and Kelsie five months, children of Charity and Rick Keezer; Julie, 17, Amy, 12, Layla, 11, and Ceaser, 9, children of Ceaser and Mirma Cushing; Blake, 15, Madison, 14, and Brock, 10, children of Clayton and Kori Cushing; she also had and extended family of five brother in laws and their families in the United States; 76 nieces, nephews, and cousins in the Philippines. To send flowers or a remembrance gift to the family of Maria S. Cushing, please visit our Tribute Store. "Email Address" would like to share the life celebration of Maria S. Cushing. Click on the "link" to go to share a favorite memory or leave a condolence message for the family.